Auditions, Performances at CVLT’s River Street Playhouse – 56 River St.
MIDDLETOWN is often compared to Thornton Wilder’s OUR TOWN. The plays share some structural and thematic similarities, but MIDDLETOWN is not Eno’s attempt to write an updated version of Wilder’s play. If anything, Eno owes as much as much to Samuel Beckett or Edward Albee as he does to Wilder for the theatrical influences on this play. Middletown, the village where the play takes place, is a kind of metaphor for that time between life’s two great mysteries – birth and death. It is what occurs between those life defining events, how and with what we fill the middle part, which MIDDLETOWN explores. The play is not plot driven. It consists of a series of vignettes in which many ordinary citizens of the town reveal the events of their lives and the qualities of their personalities which make up the web of the play. The language of the script comes across as a casual, stream-of-consciousness flow, while simultaneously bordering on the poetic. What is this play about? It is about a mighty big question: What is the nature of our existence? The play has over 20 characters, played by a cast of 12 (6F/6M). Five main characters will be played by actors who play no other parts. The rest of the roles will be double or triple-cast among the remaining members of the actors in the ensemble. Cop – male, 30s-50s: The Cop is an authority figure in Middletown. He wants to enforce the laws, and by doing so, keep the chaos of the world in check. His official responsibilities in the community are tempered and complicated by the stress and rewards of events in his personal live. Mrs. Swanson – female, late 30s: New to Middletown, Mrs. Swanson has moved to town with her husband to start a new life…and a new family. She is pregnant and hopes the joy of birth will help fill the emptiness which seems to be growing in her marriage. John Dodge – male, late 30s-40s: John is the local handyman, but his range of skills doesn’t seem to have a focal point. His life, so far, has been a continuing search for something worth committing to. Low self-esteem is all that keeps him from being the most charming of fellows. Mechanic – male, late 20s-40s: He drinks a little too much. He pops a few pills, when he can get them. He doesn’t respond well to the demands of a steady job, but he has had one glorious moment in his youth; a glory he might still recapture. Librarian – female, 50s-60s: The Librarian is an arbiter of both knowledge and wisdom. Folks with questions look to her for answers, and folks with problems trust her to provide solutions. It would be tempting to see her character as a small town cliché, but before that happens; a little more time needs to be spent in the research section. 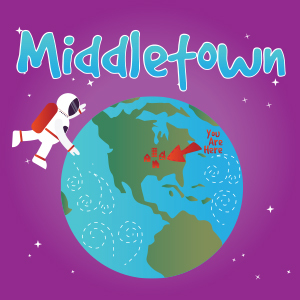 Astronauts, doctors, nurses, homemakers, writers, landscapers, janitors, tourists: Any and all of the men and women who make up Middletown. Most of these characters appear in only one scene, but each scene is self-contained – a series of mini-plays which collectively make up the whole. Every character contributes to the big themes of the play.